There will be many activities taking place that evening. 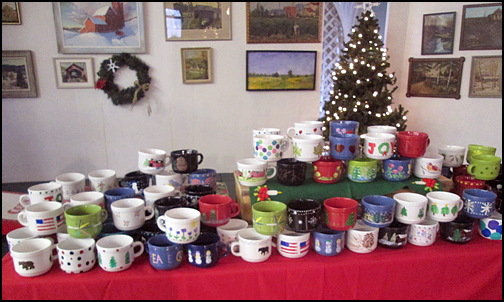 Along with a silent auction, there are stocking and basket raffles, $1 gift bags, a scavenger hunt, and of course, delicious soups/chowders/chili to warm you on a cold December evening. The soup will be served in hand-painted bowls which you can take home along with a locally sewn, colorful cloth cozy of your choice. Adult beverages will be available. The cost of admission for this event is $25. The museum cannot accept credit cards at this time, please use cash or checks to pay for these fundraising events. See you at the museum on 14 High Street in Ludlow from 6:30pm until 8:30pm. Snow date is Sunday, December 9th. Start off the winter season with an enjoyable day at this historical venue decorated with a holiday Victorian ambiance. 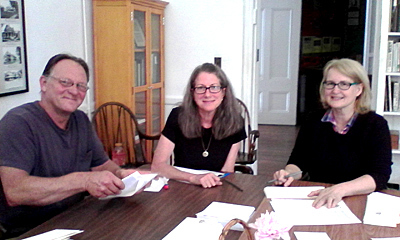 Thanks to our new neighbors, Mellisa Rockhill & John Merrow shown with Marcia helping at the museum.